5 Great Reasons to Sign Up with Norwex! This month Norwex has 5 ways to have a Happy Holiday with Norwex as an Independent Sales Consultant! Norwex Consultants earn 35% commission on every sale. At sign up only, you will receive an additional 8 – 10% products with the Kit Builders (more info below). 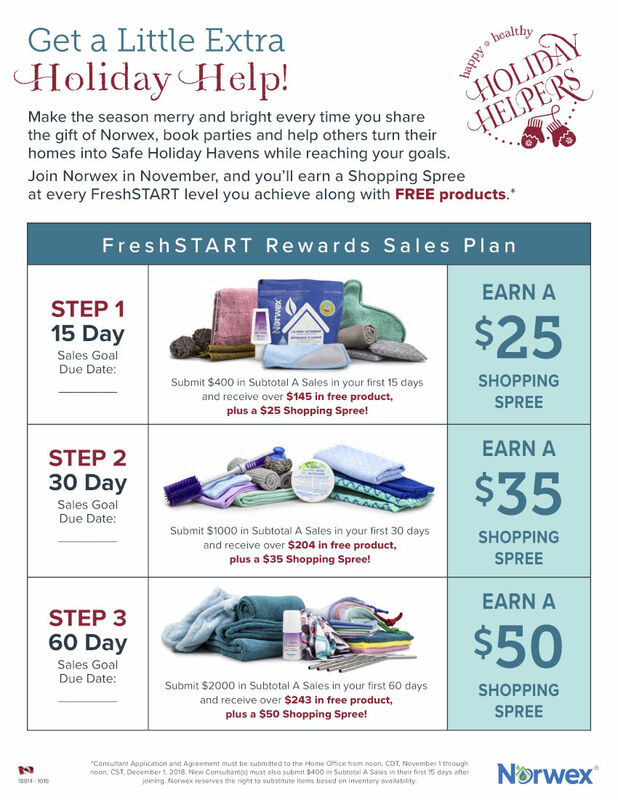 Get Rewarded through the Norwex FreshSTART Rewards Program. Lots of Free Product available to earn as a new consultant. Part Time, Full Time or Big Time. One of my favourite benefits of being a Norwex Independent Sales Consultant is having the freedom to make my own schedule. Share the gift of a chemical-free, healthy home with others. What is the STANDARD PARTY STARTER KIT? As a new consultant, the first thing you will need is some Norwex product and business supplies. Demonstrating how amazing the products work is the best way to sell it. The Standard Party Starter Kit is stocked with the 10 top-selling products! What does the Standard Party Starter Kit Cost? 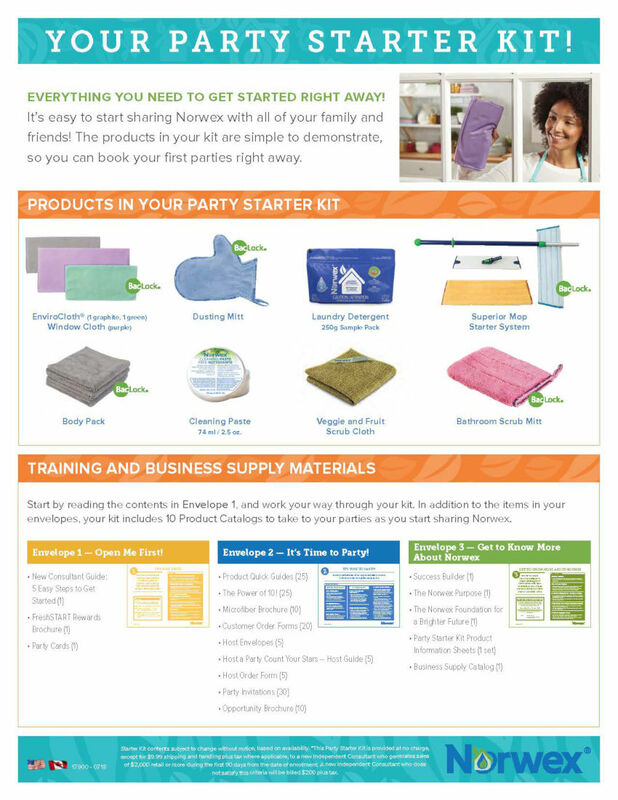 The Standard Party Starter Kit costs new consultants $200… but Norwex will not charge you for three months. This is the start-up cost for your business. But there is good news! 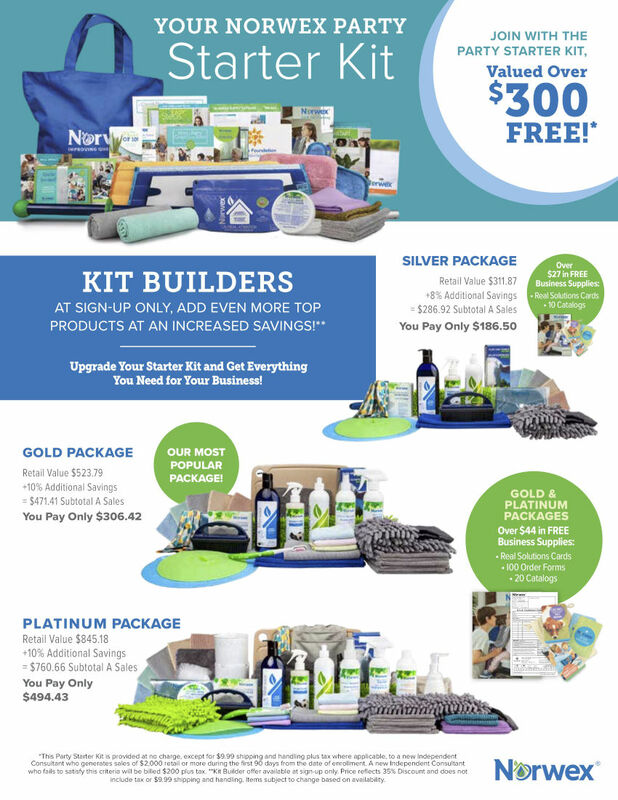 The kit is worth over $300 in product and business supplies… AND Norwex doesn’t want you to have to pay for your kit, instead, they give you the opportunity to earn it for free when you sell $2000 in the first 90 days of your business. What an incentive to sign up… when you sell $2000 it gives a you a FREE start-up and a great start to your business. How Do I sell $2000 in 90 days? An average Norwex party sells $500… So you will need to plan for 2 parties in the first 90 days of business. Host your launch party and then ask a friend or family member to host your second party. Immediately when consultants sign up, they earn a 35% commission on all their sales. So when you sell $2000, you’ll have earned $700. Hosting a launch party allows you to invite EVERYONE you know (on average when you invite 40 people, 10 people attend) and officially announce that you have started your Norwex home-based business. Be sure to invite distant relatives and encourage online orders as they all count towards your party. As the Host, you will receive the Host Rewards, earn 35% Commission (starting with your first sale), earn FreshSTART Rewards (more info below) and be well on your way to selling $2000 to receive the Standard Party Starter Kit for FREE. Ask a friend or family member to Host your next party. Before you know it, your business will be off to a great start. 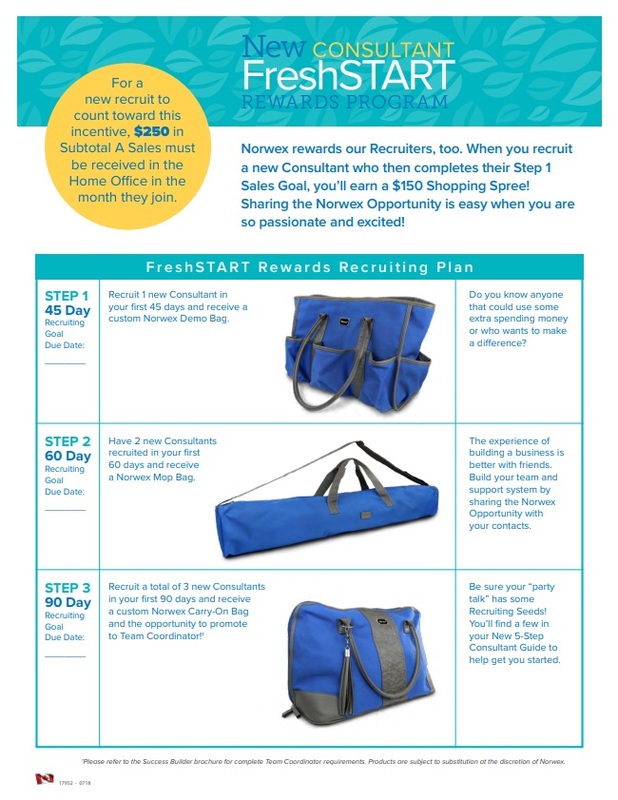 Norwex has designed the FreshSTART program to reward its new consultants by setting up attainable sales goals during the 60 days of business. With each completed goal, you will receive free product as well as earn your 35% commission. The program is set up to get you selling right away as well as stock your demo product kit so that your parties are a success. This program is amazing… when you complete all 3 steps, you will earn $700 Income, $592 Free Product and plus the Standard Party Starter Kit for FREE! PLUS, this month Norwex has added a $25, $35 and $50 Shopping Spree with each step. Norwex’s kit builders offer great discounts on products you love. Not only so that you will have a diverse demo kit, but also so you can use Norwex products in your own home. Why is that important? The more experience you have with Norwex products, the more believable and sincere you will be when demonstrating them at your parties. Plus, if you have extra product, you can give it away as door prizes or wrap it up for Christmas presents. The Kit Builders provide new consultants with great deals on Norwex products. Norwex has 3 kit options, but my favourite is the Gold Package. First, it is stocked with awesome well-loved product and essential business supplies. Second, you receive it at 45% off retail price. Third, when you buy it you earn your Step 1 FreshSTART Sales Goal (submit $400 in the first 15 days of business), it qualifies you to receive an additional $135 in FREE Product. Each kit is different; chose the one that best suits your business. 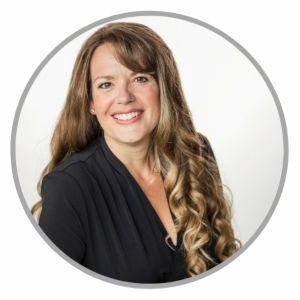 The second part of the FreshSTART program rewards new consultants for building their business within the first 90 days of business. You are probably thinking, “Grow my business? I haven’t even begun!” But that is is the best way to do it. Do you know anyone who loves Norwex products like you? Do you have a friend who could use some extra Christmas income? I started my business in 2006 and I love growing my business alongside like-minded people. Wouldn’t you like to pick who you work with? Wouldn’t you like to have someone to figure stuff out with and attend training with? It’s those people who come to mind, that you should offer this Norwex opportunity to! There are so many great reasons to sign up with Norwex… the 35% commission, product discounts, sales and recruiting rewards, freedom and flexibility in your schedule and being part of an organization that improves our world is a great place to start. What are some of your reasons for signing up with Norwex and starting your home-based business?